As baby and pet grow together, teach your child to respect an animal. Don't let the baby pull its tail or rush at it. Give the pet its space; crowding can irritate any creature. (CNN) -- When Lydia Newscomb bought her Rottweiler, Reggie, five years ago, she knew she eventually wanted to have a baby. "I thought he'd protect the family," she says. But when she gave birth to her daughter, Tyrene, two years later, Reggie wasn't very happy about it. "He would snap at her, growl when I held her," she says. "So we had to give him to a friend. It was tough." According to the American Veterinary Medical Association, approximately 800,000 people are treated for dog bites every year, most of them children. And many of these incidents occur in the home. The Humane Society of the United States says hundreds of pets end up at the pound every year because parents are faced with a dilemma: Get rid of an angry, jealous animal or the new baby. It's obvious who wins. But both organizations say there are steps you can take to help the family pet acclimate to a little one. Stephanie Shain, a spokesperson for humane society, knows what it's like to mix kids and pets. Along with her husband, Adam, and daughters Bella, 15, and Mia, 5, she shares her home with two dogs (Panda and Molly) and five cats (Broccoli, Thomas, Bannock, Carmelita and Junebug). Shain has always had pets. And because they are considered part of the family, she knew when she was pregnant with Mia that she would have to lay down some ground rules. She started early. "Two or three months out, start making changes so they are not all made at once," Shain says. "Animals don't like sudden change. Most animals like routine, so if you can change the routine gradually, before the baby comes, that's a positive step." He would snap at her, growl when I held her. So we had to give him to a friend. It was tough. That means introducing pets to the baby's room. And if you don't want pets in the room, close the door. Let them see it and then make sure it's off limits. "One of the best ways I ever saw someone handle this was a friend who actually installed a screen as the door to the baby's room," Shain recalls. "The pet could see in, because most animals are curious, but couldn't get into the room." While pregnant, start giving pet responsibilities to other family members. Some species, especially dogs, are pack animals. They follow and bond with the person who takes care of them the most. So if a pregnant mom has been running the pet's day-to-day routine, it's time to wean the pet away from her. "If the mother is the one who walks the dog, have someone else walk the dog," says Shain. "If she's playing with the cat every day, make sure someone else plays with the cat." The humane society also recommends talking to your veterinarian about your pet. Discuss potential behavioral problems and whether training might help. Also, have your pets get use to new baby noises. If you have a baby swing, turn it on. If you are going to rock your baby in a new chair, use the rocking chair before the baby comes home. And, if you don't want the pet on your lap with the baby, train the pet to stay off the furniture and on the floor before the child is born. "It's best to do this before the baby is home. Because if you say 'No, no' to the pet in front of the baby, the pet connects the negative reinforcement to the child," explains Shain. If you are pregnant and share your home with a cat, doctors say be cautious. Dr. John Buek, an obstetrician and gynecologist at Washington Hospital Center in Washington, D.C., warns his patients about a disease called toxoplasmosis. It's caused by a parasite in cat feces and although it's rare, it can be very dangerous to the fetus. "It can cause serious birth defects in a child," says Buek. "I recommend that someone else change the litter box when a woman is pregnant." Buek also warns that if you are a gardener, think about backing off from tending to flowers or veggies while pregnant. "Cats can defecate in soil, and the parasite lives in soil," he explains. "Better off to be safe and keep away from dirt of any kind." ...if you say 'No, no' to the pet in front of the baby, the pet connects the negative reinforcement to the child. Once the baby is born, but before he or she comes home from the hospital, pet experts recommend bringing a blanket or a piece of clothing with the baby's scent to your pet. Let the animal smell it, lie on it, play with it, create comfort. Once you bring the little one home, greet your pet with a warm -- but understated -- welcome. And reinforce good pet behavior around the baby with a treat. "You want the pet to view the baby as a positive experience," Shain says. 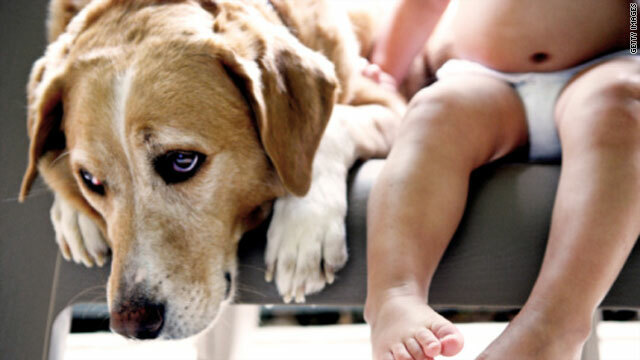 Both the veterinary association and humane society say don't ever leave a small child and an animal alone together. "Any animal with a small child needs supervision," warns Shain. Today, Lydia Newscomb's daughter is almost 3. From time to time, she and Tyrene will visit Reggie's new family. But Newscomb tries to keep them apart because Reggie still snaps at Tyrene when he sees her. "I would love to get another pet for her, but right now I think she's a little young," says Newscomb. "I miss Reggie, but it wasn't going to work. Maybe I'll buy her [Tyrene] a little goldfish for now."